The MicroFD with LyoSIM and LyoPAT does more than larger lab freeze dryers do and with fewer vials. The MicroFD provides all critical process parameters AND provides heat flux measurement utilizing AccuFlux®. Using significantly fewer vials (ie 19 vials if using a 10R serum vial) means you use less active pharmaceutical ingredient and you save time and money with extensively shorter set-up and downtime. Proven to Develop Transferable Protocols! Takes the guesswork out of protocol development. Uses less valuable of your valuable product for R&D. R&D and cycle transfer with as few as 7 vials. 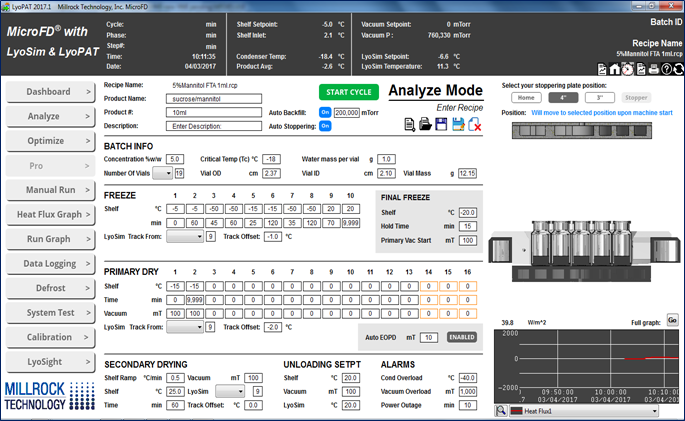 Determines Kv, Rp and other critical process parameters. 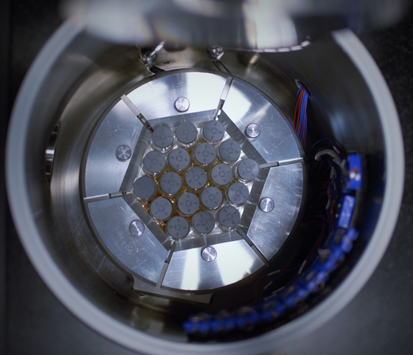 Top down view of MicroFD chamber with LyoSim blocks. 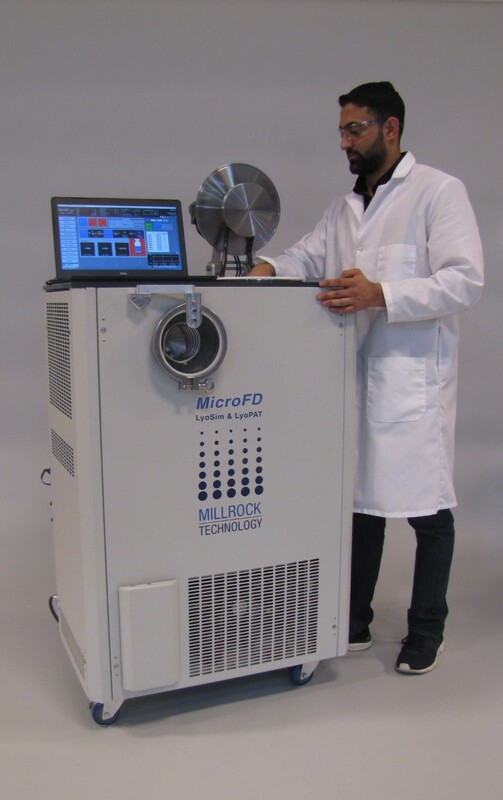 See how the MicroFD can help you with protocol development, cycle optimization and cycle transfer. Watch this presentation that introduces the MicroFD & LyoPAT technology. The patent pending LyoSIM ring is a closely coupled temperature source that can simulate center vials or the edge effect for process analysis. The LyoSIM ring temperature is controlled based on the product temperature to either simulate sublimating center vials or to simulate edge vial effects. In both cases, the close coupling of the LyoSIM ring results in far superior results than simply controlling the wall temperature. LyoPAT determines all of the critical process parameters (CPPs) for your freeze drying process, in a single run. 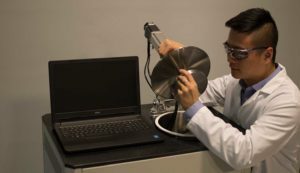 LyoPAT provides dynamic closed loop process control of Freezing and Primary Drying. LyoPAT incorporates controlled nucleation and heat flow control during freezing that produces an ice crystal structure that is more favorable to sublimation and controls the product temperature during primary drying. 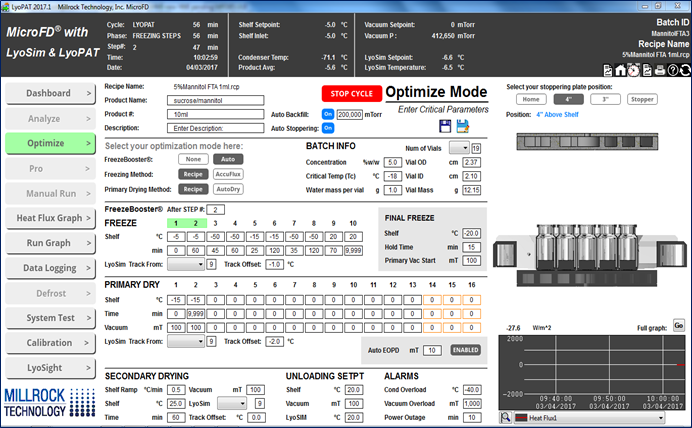 LyoPAT controls allow you, the end user, to select the various methods available for both freezing & primary drying. Utilize Analyze Mode and operate the MicroFD with your existing freeze drying cycle. 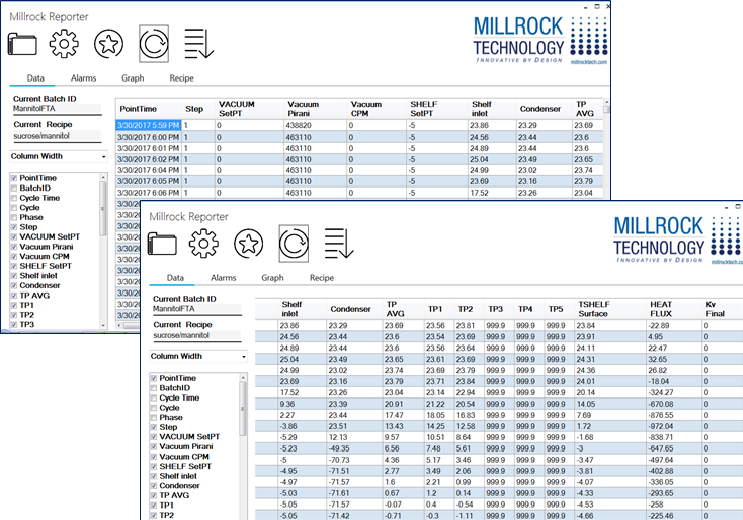 The MicroFD will execute your run and report on all critical process parameters. Utilize Optimize mode and the MicroFD will utilize a control feedback loop to optimize the the freeze drying run. You can choose which control feedback mechanisms you wish to engage in the program. A Series of Experiments Showing the Progression of Cycle Development in a MicroFD. Run 1: Previously utilized freeze drying cycle that analyzes the heat flux and other critical parameters. Run 2: The addition of Controlled Nucleation creating a more homogenous product crystalline structure that also allows heat flow events to be amplified because they happen within the same time frame of one another. Run 3: Illustrates the addition of post nucleation AccuFlux heat flow control. This helps control crystal size and thus has an effect on cake resistance to vapor flow. Run 4: All MicroFD with LyoSIM and LyoPAT tools are used to optimize the freeze drying cycle resulting in a time reduction of 60% from the Step 1 cycle.